School Sport at North Leigh is supported by the Witney Partnership of Schools, which organises a wide range of sports workshops and inter-school competitions. Children have the opportunity to take part in wide range of competitions including, football, cross-country, swimming, netball, golf and athletics. Additionally we engage with other local sports clubs including Oxford United Football Club and the Witney Tennis Club to enhance the range of activities we can offer to our children. An active after school sports club programme encourages children to engage in a variety of sports across the year and all regular attenders are offered opportunities to represent the school in external competitions. We passionately believe that children at all levels of ability should be given the opportunity to develop and improve their skills. Additionally children have opportunities throughout the year to compete in inter House competitions, including our annual Sports Day. 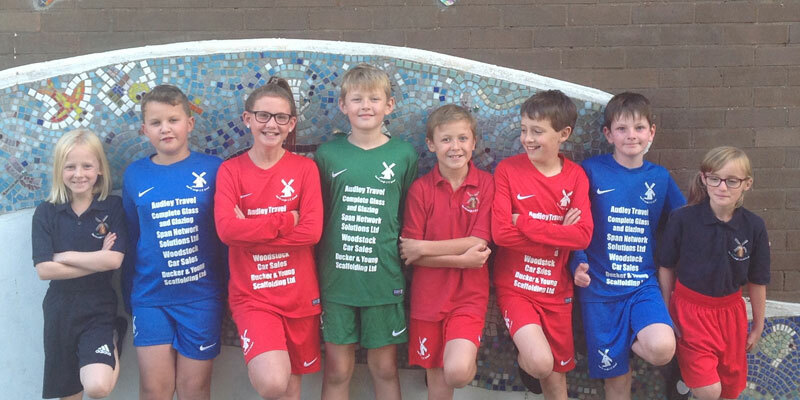 North Leigh Primary School Sports Club (The Mini Millers) would like to thank our sponsors for funding our wonderful new sports kit. We cannot express how much this means to us and the contributions of Audley Travel, Complete Glass and Glazing, Span Network Solutions Ltd, Woodstock Car Sales and Ducker & Young Scaffolding Ltd are greatly appreciated. Here are The Mini Millers sporting our brand new kits and we all look forward to making every one of our sponsors proud when we wear them! !